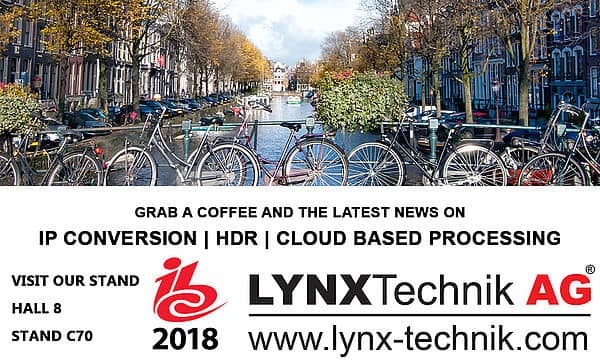 At this year’s IBC Show in Amsterdam, LYNX Technik AG®, a provider of software-defined modular interfaces for broadcast as well as professional AV and industrial signal processing applications, will introduce several new products at its stand in hall 8, C70. On display are new modules for the yellobrik® interface, RFR 1218, a new yellobrik rackframe as well as new APPS for the greenMachine® titan platform. As a world’s first, LYNX will showcase LYNX AIR, a new cloud-based signal processing solution that marks LYNX’ move into cloud-based processing without any hardware used. With the introduction of yellobrik C_EH_1911 LYNX continues its path in offering its customers future-proof solutions for today’s and tomorrows broadcast and media workflows by adding a SMPTE 2110 to HDMI SDI converter to its yellobrik product family. The C_EH_1911 yellobrik works as a bridge between SMPTE ST 2110 video over IP signals and HDMI, thus closing a gap in IP-based video production environments. The converter enables easy and seamless integration of HDMI displays or any other HDMI capable device into SMPTE ST 2110 environments. At IBC LYNX will show a new version of its well-known rackframe solutions. The RFR 1218 is the answer to common usage of converter modules in large quantities as infrastructure and mission-critical entities. By using a 19” rack tray the RFR 1218 allows for more converters to be added to one unit, increased rack-depth and offers better accessibility for the whole tray. The RFR 1218 is equipped with RJ45 Ethernet ports acting as USB to Ethernet bridges, and giving access to all mounted yellobrik converters used in the rackframe. This new feature enables the network control of all yellobrik modules by using a central web-based GUI. As a world’s first, LYNX will showcase LYNX AIR, a new solution for cloud-based signal processing. With AIR LYNX takes a step into separating the processing power from the physical hardware. Employing LYNX AIR customers can benefit from various advantages when working in remote productions. All processing is done in the cloud, and no physical hardware is needed or has to be moved from one site to the other. Further benefits are nearly endless scalability when it comes to processing power and reduced costs because customers pay only for what they really use – exact to the minute. Furthermore, LYNX will introduce two new APPS to the greenMachine® platform. The MADI APP and the HDR APP both run on the greenMachine titan. The greenMachine titan MADI APP offers 64 inputs and 64 outputs on an optical fiber SFP connector basis. The MADI APP furthermore expands greenMachine’s internal audio matrix by 64 inputs and 64 outputs (MADI IN and MADI OUT). The greenMachine titan HDR APP provides conversion of SDR to HDR and HDR to SDR signals and is fully configurable using LYNX greenGUI for setting the relevant parameters. http://tevios.eu/wp-content/uploads/2014/07/LYNX-logo-square-e1471557225989.png 154 155 admin http://tevios.eu/wp-content/uploads/2014/07/TEVIOS-RVB-white-Green.png admin2018-09-06 10:30:452018-09-06 10:32:33At IBC LYNX will showcase LYNX AIR, a new cloud-based signal processing and much more ! TEVIOS appointed Knox Media Hub partner in Belgium and Luxembourg ! TEVIOS appointed NIXER dealer !